Lech may prefer to market its luxury credentials, but beneath its upmarket ostentation it hides a world-class ski resort for all levels of skier. Bumps and powder are available for the expert, long cruising runs for the intermediate, and a selection of confidence-building slopes for the beginner. One of the most underrated ski areas in the Alps, the pistes are easily the equal of its more renowned neighbours. 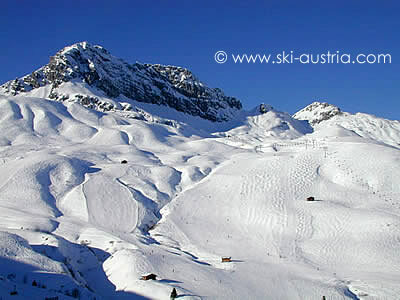 Lech, the village patronised by old aristocracy and new money, shares an underrated ski “circus” with the resorts of Zürs and Zug and recently extended to the area above the village of Warth. 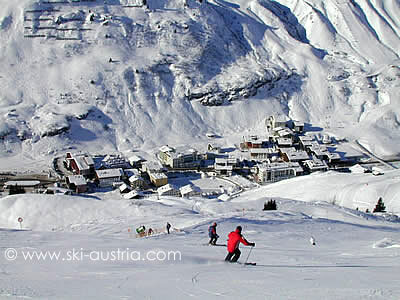 The main village skiing is on the slopes visible above the main street, but we will start with the route into Zürs, which can only be taken in one direction by using the Rüfikopf cable cars which rise from behind the tourist office. 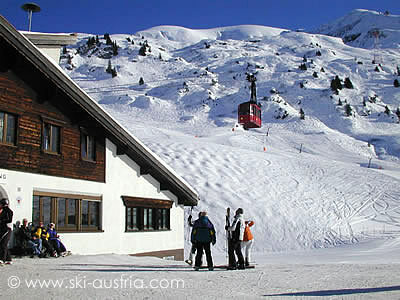 After admiring the views from the restaurant at the top station, skiers have a choice of a red or blue run to the connecting Schüttboden draglift which then links in to the Trittalp chair above Zürs. This chair and the Hexenboden lift offer undemanding intermediate runs while the Trittkopf cable car further over on the same side of the valley has lengthier and more demanding red runs. This is also the connection to the Flexenbahn gondola from Alpe Ruez, which provides the long-awaited connection to the Stuben-St Christoph area. Across the valley lies the Madloch area and the return to Lech and Zug, but, before heading back, skiers should sample the open slopes above the village and the spectacular red run 10 through the Zürser Täli from the top of the Muggengrat chairlift. The return to the other areas is eventually made via the Madloch chairlift and down one of the ski routes on the other side. All are within the competence of intermediate skiers, with 33 and 32 heading down into the pretty Zug valley and 56 heading back through lovely scenery to the top end of Lech (and a short walk through the hotels to the connecting lifts). 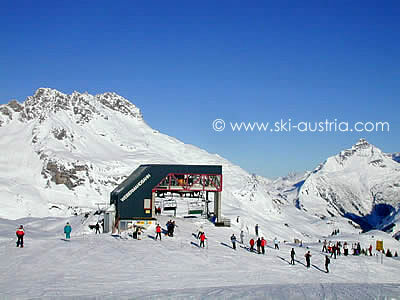 The ski routes down from the area above Lech into Zug can be seen on the opposite side of the valley as well as the Zugerberg cable car which returns skiers into the main area above Lech. 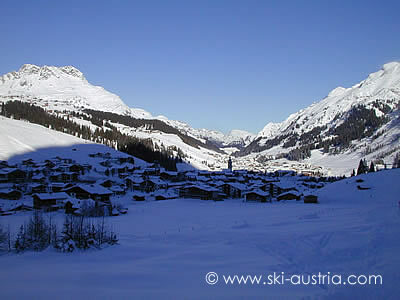 Finally, the most popular areas in Lech are the gentle and popular slopes above the village. 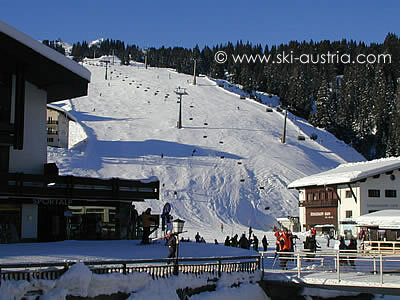 The Schlegelkopf chairlifts head up from the village centre, with the Oberlech cable car and the Schlosskopf chairlift providing alternate access to the slopes further along the area. Once on the slopes, a somewhat confusing jumble of chairs provides access into a surprising variety of runs. The Kriegerhorn chairlift offers the visible and demanding black routes down the face as well as an easier link to the Zug ski routes. Further over, a group of three chairlifts meet up in the middle of an enjoyable group of intermediate runs. 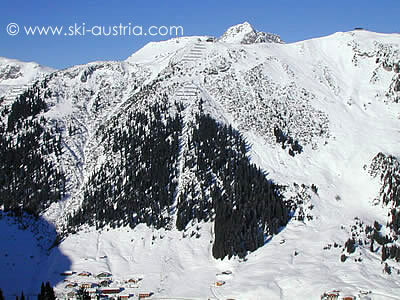 The Hasensprung chairlift also gives the option of heading over to the Steinmähder chairlift through photogenic scenery. The lowest of this group of lifts - the Weibermahd chairlift - has been supplemented by the Auenfeldjet gondola. 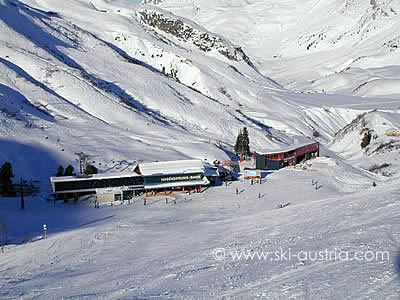 The former chairlift bottom station has now become the mid-station for the new connecting gondola which heads over towards the Auenfeld part of the Warth ski area. 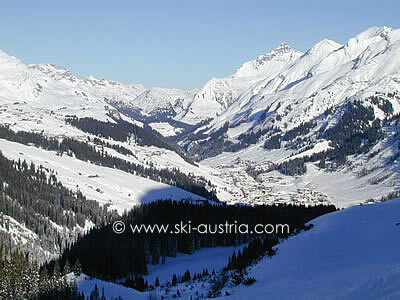 More information about the skiing on this side of the area is available on our Warth page. 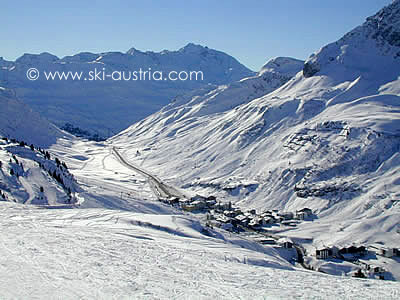 Don't forget that the Arlberg ski pass also offers access to the skiing in St Anton! 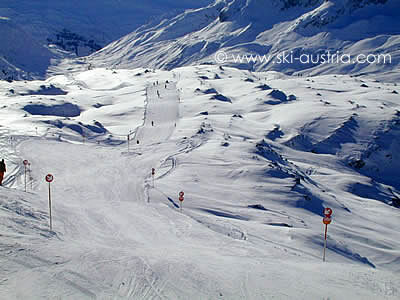 The live webcam stream below is taken from the Flühenlift in the beginners' area at Lech. Other webcams for both Lech and Zürs are available by clicking the middle button above the webcam stream.